On April 2, 2010, Ann Grosmaire died after being shot by her fiance, Conor. Moved by their Catholic faith and inspired by Saint John Paul II's forgiveness of Mehmet Ali Ağca, Ann's parents, Kate and Deacon Andy Grosmaire, felt called to forgive Conor. Together with Conor's parents, the Grosmaires fought to address the crime in a way that allowed their voices to be heard. 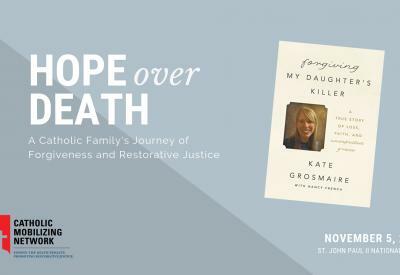 On this special evening, hosted at the Saint John Paul II National Shrine in Washington DC, Kate and Deacon Andy shared how their Catholic faith led them to restorative justice. Their story challenges us to create transformative approaches to criminal justice that promote human dignity. Staff and friends of Catholic Mobilizing Network discussed the implications for restorative justice in ending the death penalty and transforming criminal justice in the United States.